Welcome to Fish Window Cleaning! We are your local window cleaning company for Dover, Smyrna, Milford, Felton, Lewes, Rehoboth Beach, Selbyville, Georgetown, and Seaford, DE. Call (302) 491 6768 today for a free on-site estimate! Cleaning the windows, gutters, and chandeliers is something that needs to be done in every home but these tasks can be tedious, time consuming, and even dangerous. Let Fish Window Cleaning take care of the hard work for you! 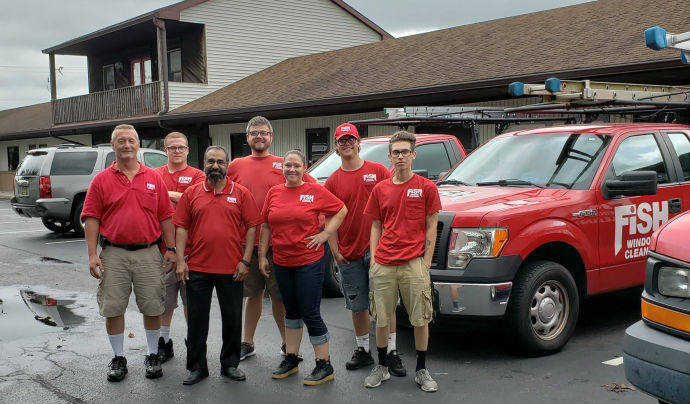 Our cleaners are licensed, bonded, and insured, and we lead the industry with a premier safety program. We even use environmentally-friendly cleaning products for extra safety. We will wear fresh shoe covers while in your home and use absorbent cloth pads under your windows as we clean to protect your flooring. We are committed to your satisfaction with all of our services! (We now also offer stain removal on both commercial, and residential windows.) WE DO IT ALL SO YOU DON'T HAVE TO! The appearance of your business makes a big difference on your customers' perceptions. 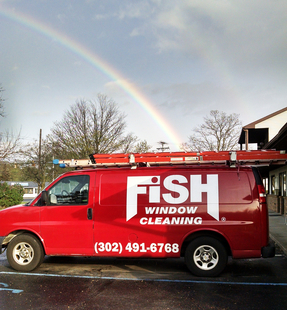 Keep giving them reasons to be impressed by letting Fish Window Cleaning maintain your storefront, sales floor, or office. We can make those large windows and glass doors sparkle! 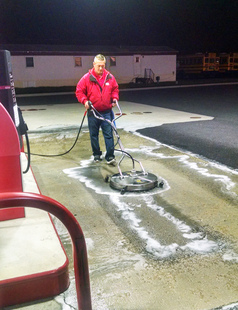 Our cleaners are licensed, bonded, and insured for your protection. We work quickly and quietly so we do not disturb you, your employees, or your customers. We can customize all of our service programs to meet your needs, budget, and schedule! Let us show you how we can Brighten Your World today! We serve the following zip codes:19958, 19945, 19977, 19941, 19968, 19946, 19902, 19962, 19960, 19970, 19939, 19934, 19975, 19947, 19904, 19951, 19901, 19963, 19979, 19966, 19930, 19973 ...and many more! - Thank-you card given to my crew upon being paid.